Mr. AS was a 58 year-old man when he consulted me in July 2005 for a work-related injury of his ankles. The injury occurred some 22 years earlier when he fell off a roof, landing on his feet and causing substantial damage to his ankles and feet. He had physical therapy for seven years following the accident, and eventually underwent arthodesis of both ankles and right foot. This helped his stability, but he continued to have significant pain. Therapeutic ultrasound, a TENS unit, and hot foot soaks only provided transient, mild relief. At the time of his initial consultation AS reported pain between 5 and 7 out of 10 (with 10 being extreme). Using a cane, he was able to walk with difficulty, but was no longer able to participate in physical leisure activities or go shopping. In addition, he had developed some shoulder discomfort which he attributed to the use of a cane. To control pain, the patient initially required significant doses of narcotics. Prolotherapy was started in May 2006. On the right ankle he had two treatments, and then refused more treatment, because of pain, until June 2007. At that time, he had another three treatments at monthly intervals. Later, in April 2008, he received an injection, and a final focal injection in August 2008 (a total of seven sessions over two years). He had only two injections in the left ankle, one in November 2007 and the final in May 2008. The solution consisted of 3.5ml P25G (phenol 2.5%, glucose 25% and glycerin 25%), 3.5ml of Sarapin (an extract from Sarracenia purpurea (pitcher plant) in alkaline solution – High Chemical Company, Levittown, PA), and 3 ml of 2% lidocaine with epinephrine per 10ml. Injections were given into all tender ligaments and, on two or three occasions, into the right tibio-talar joint from an anterior approach. The early sessions used between 6 and 10ml of solution per foot. But at the end, when the tender areas were much more focal, only 1-4ml was used per foot. Figure 1. Medial view of the right ankle and dorsum of the foot with tender points marked at his first visit in July 2005. Figure 2. Lateral view of the right ankle and dorsum of the foot with tender points marked in July 2005. Figure 3. 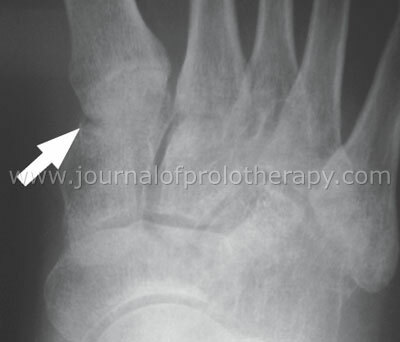 X-ray of tarsal bones of the right foot. 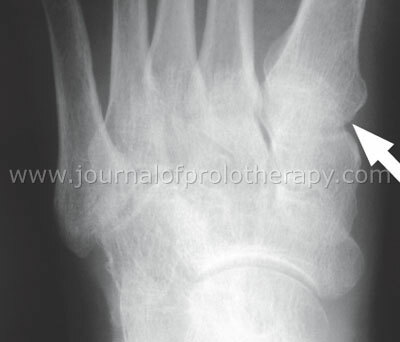 Extensive lytic and sclerotic changes are noted in the tarsal bones with extensive joint narrowing. Figure 4. X-ray of tarsal bones of the left foot. Extensive arthritis and arthrodesis is demonstrated. AS also received 10 low level laser treatments to the right ankle, some during the time he had suspended Prolotherapy, and some a day or two after injection to reduce pain. Prolotherapy of the ankles and feet resulted in substantial improvement in pain and function after more than 20 years of severe pain and disability. Arthrodesis had reduced mobility but had failed to improve his pain or function. In retrospect, I would not use the same intensive solution, since P25G, especially in the concentration administered, was significantly painful, especially in the early sessions. I would recommend using alternative, less painful solutions such as dextrose, Sarapin (a plant alkaloid) and/or sodium morrhuate, but without P25G, unless healing was unsatisfactory. This case illustrates the power of Prolotherapy. One can only imagine how much suffering could have been avoided and how much function could have been preserved if AS had sought Prolotherapy soon after his injury. This case also illustrates the power of clinical examination, since no further X-ray or MRI scan was performed. The total cost of all these injections is about the same as a single MRI scan. Marovino T. Cold lasers in pain management. Practical Pain Mgt. Sep/Oct 2004. Bjordal JM, et al. Low-level laser therapy in acute pain: A systematic review of possible mechanisms of action and clinical effects in randomized placebo-controlled trials. Photomed Laser Surg. 2006;24:158–168. Fulop AM, et al. A meta-analysis of the efficacy of phototherapy in tissue repair. Photomed Laser Surg. 2009;27:695–702.